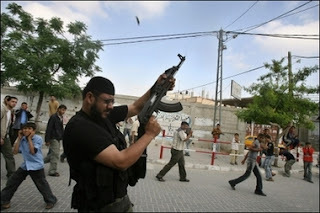 7 are dead in factional violence in Gaza! The BBC has video of the deadly clashes, HERE. Two more Palestinians were killed in factional clashes in Gaza today after fighting erupted between the leading factions over the weekend. Two Palestinian gunmen were killed in Gaza on Monday in fighting between the rival Hamas and Fatah groups, despite an Egyptian-mediated truce aimed at ending the deadliest outbreak of factional violence in months. Sources in President Mahmoud Abbas’s Fatah said tensions were so great with Hamas, its power-sharing partner, that their unity government could collapse within days if the bloodshed did not stop. In the latest violence, dozens of Hamas gunmen exchanged fire with Fatah security officers and bodyguards of Maher Meqdad, a Fatah spokesman, in Gaza City. Hospital officials said two of the security officers were killed and 10 people were wounded. Hamas’s armed wing said its men had rushed to the scene after Fatah gunmen opened fire from rooftops at homes belonging to its members. 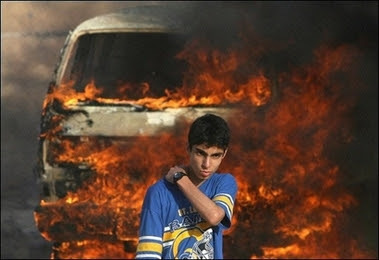 Fatah said Hamas gunmen torched an office belonging to the group at the scene of the clashes. Hospital officials said a civilian, shot in factional fighting on Sunday, died of his wounds, raising to seven the number of people killed since a new round of clashes erupted over the weekend. At least 40 people have been wounded.